We’re rich in beauty and history. Immerse yourself in a rich historic adventure. Explore North Idaho’s History Museum right downtown, take a mining tour and pan for gold, visit Idaho’s oldest mission or even a bordello museum! During the early 1800s the Northwest Fur Trading Company, a British company under the leadership of David Thompson, began to establish fur trading posts in the Inland Northwest. One of those posts, called Kullyspell House, was built on the northern shore of Lake Pend O’Reille. During that time some the French speaking traders began to use the French words “Coeur d’Alene” as nick name for the Schitsu’umsh people, who traded at Kullyspell House. In French “Coeur” means heart and “Alene” means awl, a sharp pointed tool used to pierce leather. In other words, they were known as sharp traders with hearts like the point of an awl. 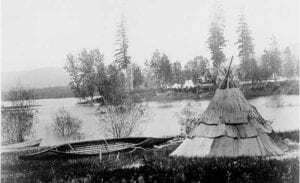 Within a few years the Schetsu’umsh people became known as the Coeur d’Alene Tribe and the large lake which was the center of their homeland became Lake Coeur d’Alene. 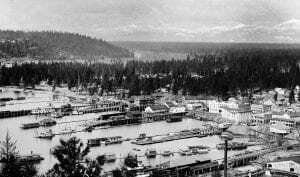 In 1878, General William T. Sherman established a military fort on the northern shore of Lake Coeur d’Alene, which he named Fort Coeur d’Alene. While the fort was under construction, a small village began to develop on the eastern edge of the Fort Coeur d’Alene. That was the beginning of Coeur d’Alene, the city by the Lake. 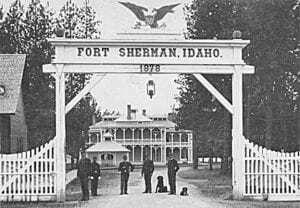 The name of the fort was later changed to Fort Sherman, which is now the location of North Idaho College. Three of the original fort buildings are still in use: the chapel, powder magazine and one of the officer’s quarters. In 1880 the Fort’s commander hired Norwegian, Peter Sorensen, to build an 85-foot steamboat, the Amelia Wheaton, to haul supplies. Other steamboats were quickly built for commercial and pleasure purposes. 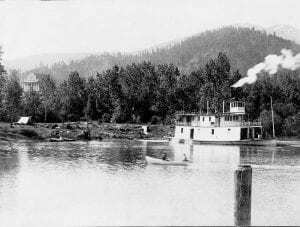 By 1910, there were more steamboats on Lake Coeur d’Alene than any other body of water west of the Mississippi River. The city of Coeur d’Alene was incorporated in 1887 and continued to flourish. Early visitors found Coeur d’Alene Lake to be one of the most beautiful lakes in the country. As the railroads and steamboats provided transportation points between the Coeur d’Alene Lake, the St. Joe and Coeur d’Alene Rivers, it soon became a destination for thousands of tourists. Camping, hunting, boating and fishing were popular pastimes. Lodges, hotels, campgrounds, attractions, and the transportation industry developed to accommodate the influx of visitors. Until the early 1890s, Coeur d’Alene served as the railroad/steamboat transfer point for transportation between the mines in the Silver Valley to the east and the smelters they fed. In the early 1900s a major timber boom caused the population to increase 16-fold in a period of 10 years. The city continued to expand from a small frontier village into the political and business center of Kootenai County and became the County seat in 1908. Today, Coeur d’Alene remains the center of business and recreational activities in the Inland Northwest. Coeur d’Alene’s strong presence is found in state government and is remarkable in its increased economic development over the past several years.